Harley is 3 months old in this picture. 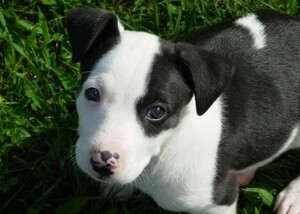 She is 1/2 Border Collie, 1/2 Mini Bull Terrier. We got him at a rescue shelter on May 2, 2009. She loves to chase my cats (much to their dismay); play fetch; sit, speak, and lay down; and she LOVES belly rubs! Cute, give Harley hugs and kisses from me. So cute. I hope your cats grow to accept him.